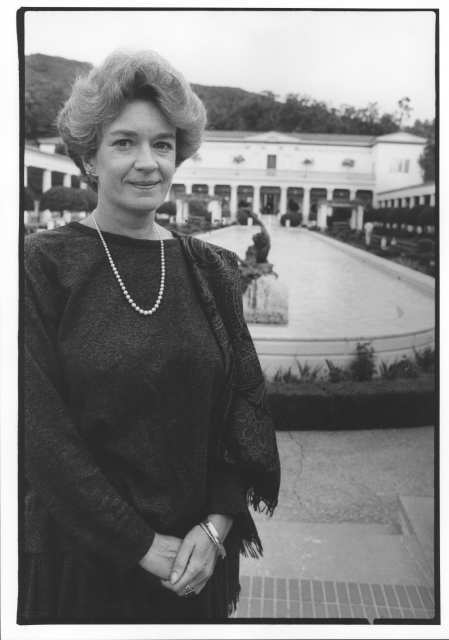 In 1986, former J. Paul Getty Museum antiquities curator Marion True recommended the purchase of an attic cup from Edoardo Almagia, the antiquities dealer now under investigation by Italian authorities for allegedly trafficking in looted antiquities. 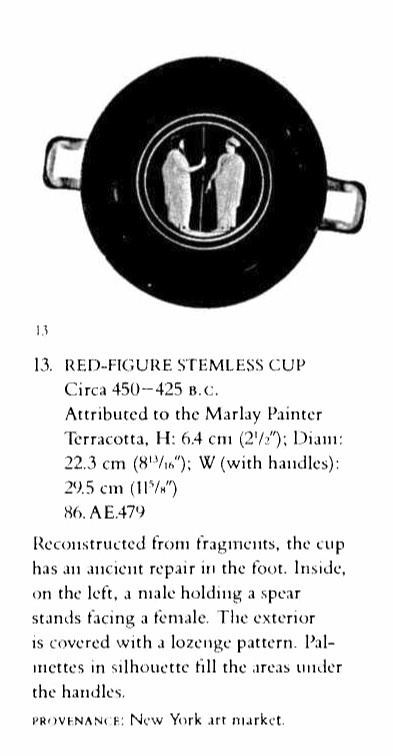 True was offered the red-figured cup attributed to the Marlay Painter in New York City, where Almagia was based, according to Getty spokesman Ron Hartwig. It was in fragments at the time. The board of trustees approved the purchase for $7,500, and the restored cup is now on display today at the Getty Villa. The cup is the only acquisition from Almagia in the Getty’s collection, Hartwig said. The Metropolitan Museum of Art and the Princeton University Museum of Art have recently returned hundreds of objects and fragments purchased from Almagia, whose criminal investigation is on-going. Hartwig said Italian officials have not asked about the Getty’s cup. Transparency check: Dallas, Tampa, the Met and now the Getty have all been forthcoming about their acquisitions from Almagia. We have not received a response to our Feb 3 inquiries to the San Antonio Museum of Art or the Indiana University Museum, where Almagia objects have also been traced. Princeton University has likewise not responded to our request for additional information about their recent return of dozens of objects to Italy. The Boston Museum of Fine Art says it is now compiling information about Almagia acquisitions for us. This entry was posted in News and tagged Boston Museum of Fine Art, Dallas Museum of Art, Edoardo Almagià, Getty Museum, Indiana University Art Museum, Marion True, Metropolitan Museum of Art, Michael Padgett, Princeton University, San Antonio Museum of Art, Tampa. Bookmark the permalink. PAS Conference: "The Future has Passed"
"Do whatever you can to avoid admitting the unattractive truth"
A possible second-best solution for orphaned antiquities? U.S. Senators are pushing for Native American Artifact legislation -- but will it do any good? Carabinieri Art Squad The Tutela del Patrimonio Culturale, Italy’s Art Squad. Interpol Art Detail Interpol has tracked the trade in stolen art since 1947.